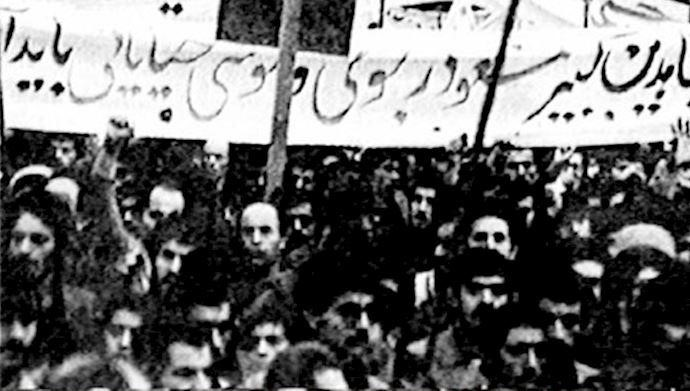 A banner calling for the release of the leaders of the Mujahideen from the Shah's prisons during the 1978 Anti-Monarchist Revolution. February 11, 2019, is 40 years to the day since the Pahlavi monarchist dictatorship was ousted from Iran. The People’s revolution that achieved this was probably the greatest contemporary political development in that country as, in its origins, it aspired to much more ambitious objectives than the mere fall of the dictatorship. However, it experienced a serious derailment immediately after its first victory when the leadership of the revolution was usurped by Ayatollah Ruhullah Khomeini who proceeded to give birth to the so-called Islamic Republic. During all these four decades, the Iranian people have constantly fought against the new dictatorship of the clergy, which, even according to its own leaders, has never experienced political stability. A system of religious rule that had set itself the ambition of becoming an Islamic empire, a mega Caliphate, encompassing the whole Muslim world, that would last for centuries like the Ottoman empire, has not ceased to suffer revolutionary tsunamis that have brought it to the brink of overthrow, which is now the daily nightmare of Tehran's leaders. The Iranian people’s struggle against this Caliphate, which draws its ideals from the brutal and benighted Middle Ages, has various aspects: political, social, private life, human rights, freedom of religion and religious convictions, etc. But the most bitter struggle of the Iranians against the theocracy has always been for popular sovereignty and a political system that derives its legitimacy from universal suffrage. This struggle began with the advent of the Islamic Republic in 1979 and went through many ups and downs before reaching a peak during the uprisings of December 2017. Since then, there has been no respite, so that the highest leaders of the ruling power now recognize, in the open, this sword of Damocles above their heads. "They said they will do this and that in 2018. It could be a trick. They may have beaten the drum in 2018 while they plan to act in 2019," warned Ali Khamenei, the current Supreme Leader of the Islamic Republic, in a speech broadcast on 12 December 2018 by State Television, IRTV. Between 1963-1977, Khomeini (left in the photo) had chosen to withdraw from politics and locked himself in Najaf, a Shia holy city in Iraq. The Anti-Monarchist Revolution in Iran was not a spontaneous movement. 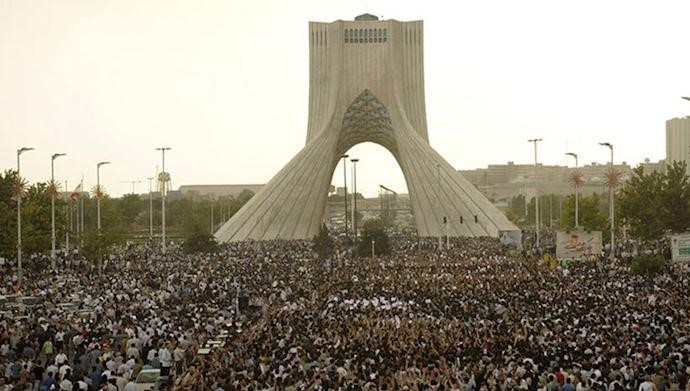 It was the result of long struggles by the Iranian people against the Pahlavi dictatorship. 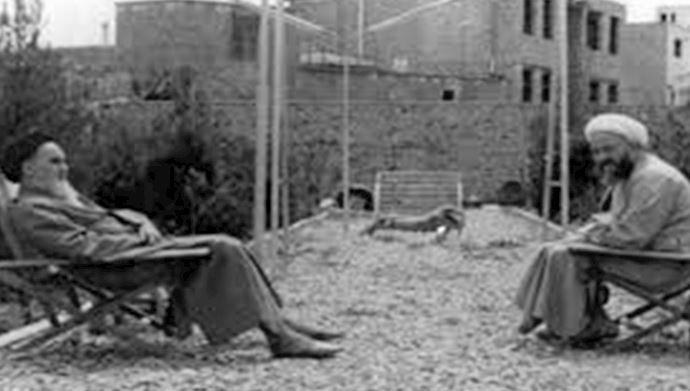 In 1953, when Iran was set to experience true democracy with Mohammad Mossadegh's government, the Shah, Mohammad Reza Pahlavi, dismissed the latter in a coup d'état in which the CIA and the cleric network played the lion's share. This sad episode led to a new political climate in which the Shah ruled the country with an iron fist, putting an end to the dissidents' parliamentary struggles. The last attempt at a peaceful protest failed on June 5, 1963, when the Shah did not tolerate the demonstration of clergy supporters protesting his liberal religious reforms and repressed it in blood. This date is also the first time that we heard about Rouhollah Khomeini who was not then an Ayatollah, owing this title to the clerical council of Qom who gave it to him to avoid execution by the monarchy in reprisal for his leading role in the protests. Instead, after this event, Khomeini was sent into exile and was not heard from again until the renewed wave of Antimonarchist Revolution of the late 1970s, fifteen years later. In the face of fierce repression, traditional opposition parties such as the National Front (FN) and the Movement for the Liberation of Iran (MLI) are silenced and de facto diverge from the Iranian political spectrum. It is in this atmosphere that armed struggle movements against the dictatorship were born. Two movements, the People's Mojahedin Organization of Iran (PMOI or in Persian, MeK) and the Fedayeen People's Guerrillas Organization of Iran will be at the forefront of this new struggle. 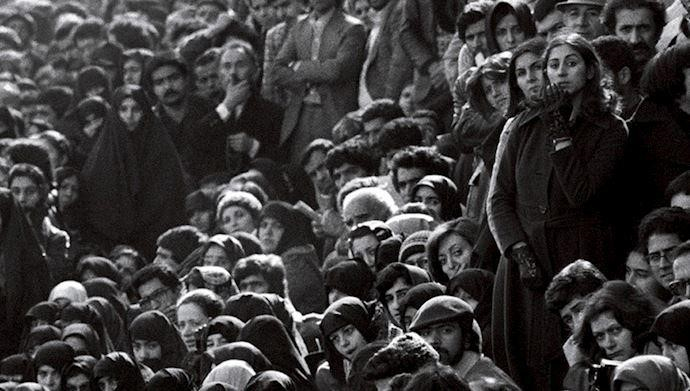 The influence of these two movements has not ceased to grow in intellectual circles (especially universities) and it was these two movements that carried the fight for the fall of the Pahlavi dynasty. Khomeini was indeed the one who stole a revolution that initially belonged to these two movements. The Antimonarchist Revolution aspired to freedom, not to everything the Islamic Republic claims. A stranger who took over the leadership of the Revolution overnight Before 1977, the PMOI and the " People's Fedayeen " were the only actors on the Iranian political scene who aspired to overthrow the dictatorship. Khomeini had chosen to withdraw from politics and locked himself in Najaf, a holy Shia city in Iraq. The historian Hamid Rohani, very close to Khomeini, recounts the atmosphere of those years, between 1963 and 1977: "Many were convinced that Imam[Khomeini]'s political career had come to an end and that it was the PMOI that took the lead in the revolution. It is true that the People's Mojahedin had acquired a broad social base. " "In the years 1977-1978, one to two percent of the population knew the Imam," said Mehdi Kalhor, a close media adviser to Mahmoud Ahmadinejad when he was President of the Regime; in an interview in an IRIB broadcast on February 6, 2018. "For the people, the real heroes of the struggle against the Shah were the People's Mojahedin and the People's Fedayeen. "The demands of the 1979 Revolution had nothing to do with what we're trying to get at today." 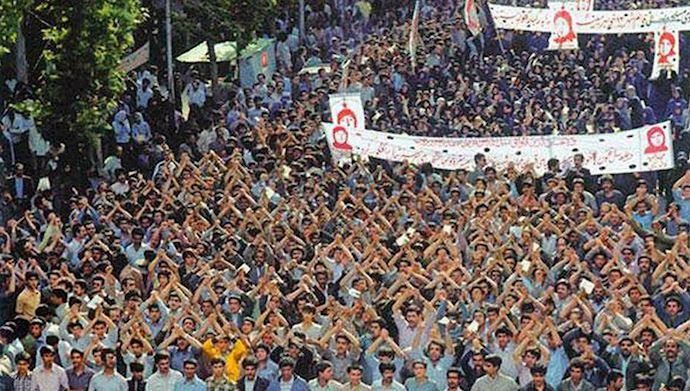 The theorist recalls that a glance at the media of those years clearly shows that the main claim of the 1979 Revolution was freedom. Khomeini took advantage of the fact that the main leaders of PMOI and the " People's Fedayeen " were either in prison or killed by the dictatorship to steal this revolution and divert it towards a political system that from the start betrayed the main claim of the anti-monarchist movement. During their demonstration in Isfahan in January 2019, Iranian teachers chanted: "We didn't make the revolution for that! Not for prisons, corruption, precariousness, and segregation!" This slogan and dozens of others along the same lines are the historical response of the Iranian people to the Islamic Republic. Day after day, the ruling clergy, led by Khomeini and then Khamenei, has consistently blocked any possibility of popular sovereignty and increased the absolute powers of the Supreme Leader at the head of power, going so far as to describe the theocracy as "the absolute monarchy of the Leader". Khomeini returned home to Iran with the promise to form a broad Constituent Assembly that should have decided on the future mode of governance. This assembly never came into being. It gave way to the establishment instead of an Assembly of Experts entirely made up of members of the clergy, close to Khomeini, without a single dissident in its ranks. It was this Assembly that wrote the Constitution of Velayat-e Faghih[Supreme Leader]. Ayatollah Ahmad Azari Qomi, a high dignitary of this Assembly, recounts the limits of the power of this Supreme Leader: "The Supreme Leader has total control over the whole world, from humans to celestial creatures, objects, plants, animals, etc. " This constitution will only be the first step in Khomeini's betrayal of the 1979 insurgents' demands and will deprive the Iranian people of their participation in the country's political life. In 2009, the sham election led to a major protest movement. After the Assembly of Experts, the Council of Guardians will become an instrument in the hands of the Supreme Leader to ensure in advance the outcome of all electoral staging is as he desires The first task of this council is to reject the candidacy of all rivals deemed too cumbersome in all elections, before confirming the final results, to give them a semblance of legitimacy. During all these four decades, EVERYTHING has been faked in all the shows that have been called elections in Iran, from the number of participants to the results of the votes. The maneuvers were so gross that even the regime's former prime minister, Hossein Moussavi, could not hold back his anger when he himself was the victim of these schemes during the 2009 presidential elections. “The numbers have been multiplied by eight, to be presentable in the media”, Moussavi revealed. This figure was later confirmed by Mohammad Reza Khatami (the brother of former President Mohammad Khatami) and by Mahmoud Ahmadinejad himself, while his own election to a second term as President in 2009 had led to a major protest movement in the country. A year after coming to power, Khomeini issued a fatwa to spill the blood of the supporters of the People's Mojahedin, a movement with hundreds of thousands of supporters. The day after the advent of the Islamic Republic, in an intervention before a limited number of members of his seraglio, Khomeini was explicit about his intention to ban all political parties, even if it meant being compared to the dictatorship of the Shah: "Let them shout all they want. Yes! I want to do like the Shah! ", he says in particular in this intervention, a video of which will not be released until several years after his end. The founder of the Islamic Republic went further with a fatwa issued on November 16, 1980 (one year after gaining control) to shed the blood of PMOI activists, a movement that organized rallies of several hundred thousand people. The fatwa was kept secret before being revealed several years later. During his presidential campaign in the summer of 2017, Mohammad Bagher Ghalibaf, then Mayor of Tehran, acknowledged that the ruling political class represented only 4% of the population. This is a disturbing admission, especially when we know that the regime's leaders always multiply the real numbers for their benefit. Despite all this, neither Khomeini nor his successor Khamenei was ever able to subdue the resistance movement of the Iranian people, which has not ceased to rise up during these forty years. During the December 2017 uprisings in 142 cities in Iran, young insurgents set fire to more than 60 seats of Khamenei's special representatives in the provinces and to more than 20 mullahs' training centers, true symbols of the ruling power as these organizations aim to shape the future elites of the theocratic regime. Since then, the rumble has never stopped and Khamenei has not stopped shouting "Beware of conspiracy". The Mullahs do well to beware. Indeed, there is a plot afoot which is gathering momentum as it gathers support, inside Iran and worldwide, and will soon put an end to four decades of the worst dictatorship in the contemporary world.